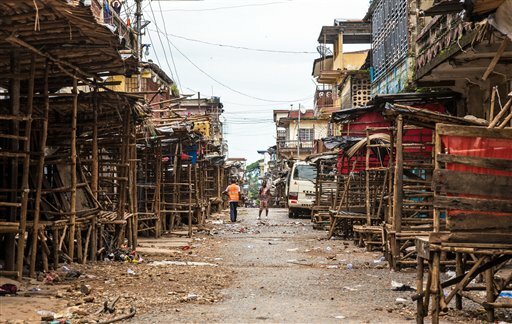 FREETOWN, Sierra Leone (AP) — Frustrated residents complained of food shortages in some neighborhoods of Sierra Leone’s capital on Sunday as the country reached the third and final day of a sweeping, unprecedented lockdown designed to combat the deadly Ebola disease, volunteers said. While most residents welcomed teams of health care workers and volunteers bearing information about the disease, rumors persisted in pockets of the city that poisoned soap was being distributed, suggesting that public education campaigns had not been entirely successful. The streets of the capital, Freetown, were again mostly deserted on Sunday in compliance with a government order for the country’s 6 million residents to stay in their homes. Spread by contact with bodily fluids, Ebola has killed more than 560 people in Sierra Leone and more than 2,600 across West Africa in the biggest outbreak ever recorded, according to the World Health Organization. The disease, which has also touched Guinea, Liberia, Nigeria and Senegal, is believed to have sickened more than 5,500 people. Sierra Leone’s government was hoping the lockdown — the most aggressive containment effort yet attempted — would turn the tide against the disease. There were rumors in Freetown on Sunday that officials would opt to extend the lockdown, but a Health Ministry statement issued Sunday night confirmed it had ended. The statement said that 75 percent of the targeted 1.5 million households had been contacted by outreach teams, and that outreach would continue in “hot spots” around the country. Health care workers had taken advantage of the lockdown to bury 71 dead bodies by Sunday morning, Health Ministry official Dr. Sarian Kamara said on a radio program. The bodies of dead Ebola victims are highly contagious, making safe burials essential to stopping the spread of the disease. Sundays are usually quiet for residents in Sierra Leone, who go to church or stay at home with many businesses and restaurants closed. In the city center, despite police efforts to encourage people to stay inside their homes, most families sat on their verandas chatting as radios blared through the streets. People were urged to stay tuned to their radios and televisions for public information on the lockdown. The National Power Authority also provided uninterrupted electricity during the lockdown, so people didn’t have to rely on generators. In Bonga Town, a shantytown community near the national stadium in Freetown, some residents were upset that handouts of rice were distributed only to certain families, said Samuel Turay, a 21-year-old volunteer. The community often serves as a way station for rural Sierra Leoneans trying to relocate to the capital, and many homes are makeshift and dilapidated, with heavy rocks holding down zinc roofs so they don’t blow away with the wind. “They expected, when they saw us, that we were coming with food, but unfortunately we are just coming to talk to them. So they were not so happy about it,” Turay said. The city’s poorer residents generally use the money they earn each day to buy food, making planning for a three-day lockdown impossible, said Miatta Rogers, a mother living in the west of Freetown. The World Food Program provided food packages including rice, beans and a form of porridge throughout the lockdown, though its staffers were not going door to door and were instead focused on serving houses placed under quarantine by medical teams, spokesman Alexis Masciarelli said Sunday. The agency distributed two weeks’ worth of rations to 20,000 households in slum communities just prior to the lockdown, he said. Some residents of Bonga Town and other similar communities said the provisions they received were insufficient, Turay said. Another volunteer, Kabarie Fofanah, said some families were refusing food outright out of fear it was poisoned. Both Turay and Fofanah said they encountered Freetown residents who feared the soap being distributed by outreach teams was poisoned and potentially lethal. Other reports said some families were removing stickers indicating their homes had been visited, in hopes of receiving more soap. “Some are tired of the lockdown, but most are happy because they are afraid of the virus and they want to be protected and have this country be declared as Ebola-free,” Fofanah said. Officials say residents have overwhelmingly complied by staying in their homes. Only one incident of violence has been reported, when health workers trying to bury five bodies in a district 20 kilometers east of Freetown were attacked on Saturday. After police reinforcements arrived, the health workers were eventually able to complete the burial. The two other countries hit hardest by the outbreak are Liberia, which has recorded the highest number of cases and deaths, and Guinea, where the first cases were confirmed in March. On Saturday, Guinean officials said five doctors contracted the disease while performing a Caesarean section on an infected woman in the capital, Conakry. Dr. Sakoba Keita, national coordinator for Ebola, said the incident was due to the doctors’ “carelessness” but also underscored how vulnerable health workers are to Ebola. In Liberia on Sunday, officials opened a new 150-bed treatment center, the country’s largest, in the Bushrod Island section of Monrovia. Four ambulances arrived almost immediately, full of sick patients. Corey-Boulet reported from Abidjan, Ivory Coast. Michael Duff in Freetown, Sierra Leone, Youssouf Bah in Conakry, Guinea, and Jonathan Paye-Layleh in Monrovia, Liberia, contributed to this report.